A-HOTEL.com - Luxury and cheap accommodation in Cabo da Roca, Portugal. Prices and hotel, apartment booking in Cabo da Roca and surrounding. Offering a year-round outdoor pool and views of the sea, Quinta do Cabo Guesthouse is situated in Azóia, at a 20-minute drive from Colares and 35 km from Lisbon. The bed and breakfast has a sun terrace and views of the pool, and guests can enjoy a drink at the bar. Set in Sintra, 11 km from Pena National Palace, 11 km from Moors Castle and 16 km from Sintra National Palace, Holiday home Rua do Moinho features accommodation with a balcony and free WiFi. The property has pool views. Akivillas Sintra Targa, featuring an outdoor swimming pool, a garden and a terrace, is situated in Sintra, 11 km from Pena National Palace and 11 km from Moors Castle. Free WiFi is provided. Set in Sintra, 12 km from Pena National Palace and 12 km from Moors Castle, Azoia Wind Mill offers free WiFi. Located 17 km from Sintra National Palace, the property provides a garden. Featuring free WiFi and an outdoor swimming pool, Quinta Vale da Roca offers accommodation in Azoia, 2 km from Cabo da Roca. With an architecture rich in wood and stone details, the unit is inserted in a rich forest area, which includes a vineyard. Set in Azoia, TerrAzoia offers accommodation with a patio and free WiFi. Guests wishing to travel lightly can make use of towels and linens for an additional supplement. Located only 3 km from Praia de Ursa Beach and offering a renovated seasonal outdoor pool, Convento Sao Saturnino is located in Sintra, in the Lisbon Region. This typical Mediterranean style property offers a garden, a terrace and a bar. Located in Sintra, 12 km from Pena National Palace, CheckinCheckout - Retiro da Adraga provides free WiFi and sea views. Fitted with a terrace, the units feature a flat-screen TV and a shared bathroom with shower. Perfect for guests seeking a tranquil retreat in the Sintra-Cascais Natural Park, halfway between historic Sintra and Cascais, this family-run bed and breakfast radiates a unique charm. Nestled on an organic lime farm, Quinta do Rio Touro impresses with its traditional decor and scenic setting. Surrounded by a pool terrace and natural vegetation, Quinta da Faianca offers views over the Atlantic Ocean and the Sintra-Cascais Natural Park. It has free Wi-Fi in the common areas and is 10 minutes’ walk from Adraga Beach. Situated in Sintra, 12 km from Pena National Palace and 13 km from Sintra National Palace, Pensao Sisudo features accommodation with free WiFi and a terrace. A continental breakfast is served daily at the property. Located in a typical Portuguese village, Almoçageme, Casa Bolacha offers accommodation overlooking the Atlantic Ocean. It includes an outdoor pool and is located a 2-minute drive from Adraga Beach and 4-minute drive from both Maçãs and Praia Grande Beaches. Ferienhaus Colares 201S in Sintra features accommodation with free WiFi, 11 km from Pena National Palace, 12 km from Sintra National Palace and 13 km from Quinta da Regaleira. This holiday home is 16 km from Moors Castle. Situated 11 km from Pena National Palace in Sintra, Ferienhaus Colares 200S offers accommodation with a kitchen. This property is 12 km from Sintra National Palace and has free WiFi. Located in Aldeia Galega, Quinta Casa Portuguesa features accommodation with seating area. Complimentary WiFi is provided. Featuring garden views, Apartment N247 is situated in Sintra, 10 km from Pena National Palace. Guests staying at this apartment have access to free WiFi. Apartment N247 - 2, boasting barbecue facilities, is located in Sintra, 10 km from Pena National Palace and 10 km from Moors Castle. This property is 12 km from Quinta da Regaleira. 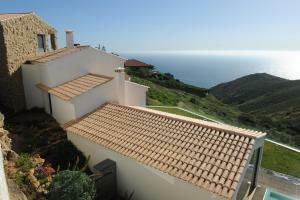 Biscaia Atlantic View is situated in Malveira da Serra and offers barbecue facilities, a garden and a terrace. This holiday home also features a private pool and free WiFi. Offering free WiFi and sea views, Guincho Prime Villa by Homing is an accommodation located in Alcabideche. This villa features a private pool, a garden and barbecue facilities. Set within 9 km of Pena National Palace and 9 km of Moors Castle in Sintra, quinta Colina flora provides accommodation with free WiFi and seating area. All units feature a flat-screen TV, a private bathroom and a fully equipped kitchen.